God commanded humans and animals leaving Noah’s Ark to reproduce and multiply and fill the earth. 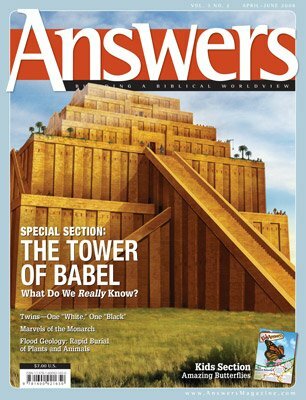 According to the Bible, humans disobeyed God’s command and settled at Babel. In contrast, if biblical geologists are right about which rocks were formed after the Flood,1 animals quickly spread over the earth as God had commanded. Dotted around the world, sitting on top of rocks we think date from the end of the Flood, are piles of sediment thousands of feet thick. We deduce, then, that these are post-Flood sediments, leaving a record of conditions on the earth for the centuries immediately following the Flood. The nature and thickness of the sediment suggests that centuries of catastrophes continued to occur while the unstable earth was recovering from the violence of the Flood. Some of these catastrophes, such as supervolcanoes, created excellent conditions for preserving fossils. These fossils show animals appearing on each continent—and being buried in local catastrophes—long before humans are found on that same continent. Most mammal “kinds,” such as horses and dogs, left the Ark by family. Biology research suggests that each kind diversified into scores of species and varieties before humans ever left Babel. Most of the diversity of animals died out quickly, leaving fossils of many extinct species but just a few species surviving in the present. (By Abraham’s day, it appears that sheep, oxen, camels, and donkeys were already similar to the ones we see today; see Genesis 12:16 ). Before humans left Babel, it appears that apes had already spread over much of the world, diversified, and died out quickly. Apes follow this same pattern. Before humans left Babel, it appears that apes had already spread over much of the Old World and had diversified into a large array of species. “Lucy” is one of the more famous specimens of one of these ape species—Australopithecus afarensis. The leg and arm designs that God placed into apes allowed them to move comfortably in trees. 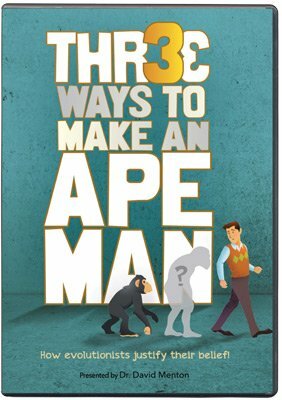 These designs make ape fossils easily distinguishable from human fossils. Paleontologists are still discovering species of post-Flood apes. If we are correct about post-Flood rocks, apes were at their highest point of diversity and were buried in local catastrophes just before humans spread out from Babel. Their fossils show that God placed a fascinating variety of designs in the original apes at creation and these designs were later expressed in post-Flood apes. Some were designed exclusively as knuckle-walkers, like the modern apes. 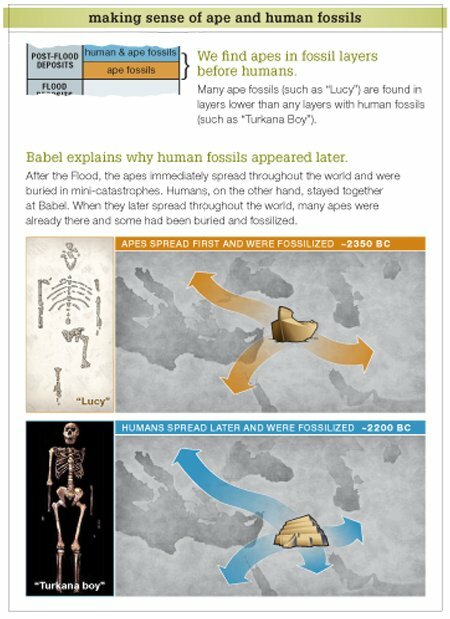 Others, such as the australopithecines (for example, Lucy), were provided with a more upright stature, probably so that they could split their time between the trees and the ground. Even more fossil diversity is likely to be found in the future. The few survivors in the present give us only a small picture of the variation God placed into apes at their creation. While the animals were diversifying and spreading out from the Ark, the Bible tells us that humans rebelled against God and stayed in one place, desiring to give themselves a name above that of God. When God forced them to obey His command by creating distinct languages, they dispersed from Babel in small family groups. Preserved in post-Flood sediments older than any Neanderthals and Hobbits are Homo erectus fossils.3 Aside from the skull, Homo erectus skeletons are virtually indistinguishable from modern humans, so the evidence indicates they are human. And, since humans did not disperse across the world until after Babel, the distribution of Homo erectus across the Old World (Java, China, Africa) suggests they not only date from after the Flood, they also date from after Babel. Homo erectus is thus not only the oldest human fossil we have following Babel but the only human fossil for some time after Babel. From this we infer that the Homo erectus form is probably what humans looked like at the time of Babel. As humans spread across the world, they found the continents already filled with a diverse array of animals and plants, including the full diversity of apes. Many of these apes had already died and been fossilized before humans even arrived. Although humans were forced to obey God’s command to fill the earth, evidence suggests that they continued to rebel against God in other ways. A vast number of mammals disappear in the upper portions of the fossil record at about the same time that human fossils were first found. Although this mass extinction occurred during a change in climate, climate alone can’t account for the extinctions because the same mammals flourished and diversified during an even more radical cooling and drying climate decades before Babel. This suggests that humans may have contributed to, or even been responsible for, the mass extinction of mammals. If so, humans spreading out from Babel were abusing the creation rather than caring for it. Another suspicious event in the fossil record is the sudden disappearance of large differences in human forms (for example, the disappearance of neanderthalensis and floresiensis). Humans today vary in appearance far less than we used to. It also appears that modern humans vary less in their DNA than they used to. We suspect this because mitochondrial DNA in Neanderthal fossils suggests that they did not leave any descendants among modern humans (see Four Women, a Boat, and Lots of Kids). Also, humans show much less variety in their DNA than most animal species that are spread worldwide. The narrow differences among modern humans, in turn, suggest that whole people groups were wiped out after Babel, narrowing the variation within the human population. Was this extinction entirely due to the challenges of survival in an earth still recovering from the Flood? Or could it be that human violence is responsible for some of this extinction? Could greed, national wars, or even overt racism be responsible? At this point no one knows. But at the very least, we can say that neighboring people groups made no apparent effort to aid their fellow man when threatened with extinction. Such cruelty would not be surprising. Scripture tells us that humans at Babel were rebellious against God. They were forced to fill the earth. Rather than caring for God’s animals and their human brothers, human families spreading out from Babel may have even hunted many of them down and driven them to extinction. Dr. Kurt Wise earned his PhD in geology from Harvard University and has published numerous articles on biblical geology. He has also written the book Faith, Form, and Time. He is now the director of the Creation Research Center at Truett-McConnell College. S. A. Austin et al., “Catastrophic Plate Tectonics: A Global Flood Model of Earth History,” in Proceedings of the Third International Conference on Creationism, ed. R. E. Walsh (Pittsburgh, Pennsylvania: Creation Science Fellowship, 1994), p. 645. Kurt P. Wise, “The Flores Skeleton and Human Baraminology,” Occasional Papers of the BSG 6:1–13, http://www.bryancore.org/bsg/opbsg/006.html, 2005. For the modernness of their brains see D. Falk et al., “The Brain of LB1 Homo floresiensis,” Science 308 (5719): 242. Older is determined by (1) fossils found in underlying sediments, (2) older radioisotope dates (which really are older if radioactive decay rates were faster in the past), and/or (3) being found with fossils unique to older sediments.